« Is Prince William Descended from King Arthur? On Friday, Prince William, descendant of King Arthur, will marry. In the newlyweds’ honor, I am posting the marriage of Arthur and Guinevere as written in Lord Tennyson’s Idylls of the King. 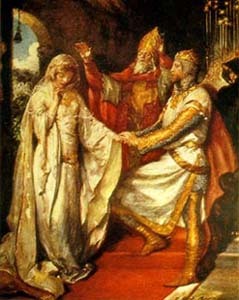 May Prince William and his future bride have a wonderful life together and a far happier end than Arthur and Guinevere. And Arthur said, `Behold, thy doom is mine. `Shall Rome or Heathen rule in Arthur’s realm? `Blow trumpet! he will lift us from the dust. `Blow, for our Sun is mighty in his May!